As the sunlight makes its way to my face, I can see my breath as it leaves my mouth and slowly rises into the crisp, cold air. From atop this sandstone dome, my 360 degree view is uninterrupted. Wilderness stretches out across the horizon in every direction. There are steep, narrow canyons and broad, sandy washes. Yucca, with their long, wind-battered stalks, cling to small patches of dirt, while the sweet smell of desert sage accompanies the slight breeze. Mountains rise in the distance, the Henrys to the west and the Abajos to the northeast. Directly south, the mystical and sacred Navajo Mountain stands alone. It is a rugged place, this canyon country. Vast and expansive, while on a high point like this one, it could easily be mistaken for endless. The sun is cresting over the horizon to my left as the full moon slowly drops out of view to my right. In this first light of morning, I sit suspended between these two heavenly bodies. This is a magical place. It is a place that I, as others before me, have fallen in love with. The desert is not an easy place to love though. Upon first glance, many consider this expanse of red rock to be a wasteland, far too harsh to inhabit. The canyons are too steep, the soil is too dry, and the distances too great. Interestingly enough, these are some of the same character traits I have become so enthralled with. There is an untainted beauty that lies at the heart of its ruggedness. It is a deep beauty, the kind that is often felt before it can be seen. Unrecognizable to the passing glance, it will not be found through the windshield of a car. This is a beauty that takes time. There is comfort found in the harshness here, a comfort that is birthed out of the uncomfortable. To know solace, one must first know distress. Here, I experience the blazing summer sun as well as the soothing shade a tiny juniper. I feel the bombardment of sand filled winds and the encompassing peace of a still, moonlit night. I know the taste of parched, chapped lips and the sound of a trickling, life giving spring. Hidden seeps, where water slowly sweats its way out of rock walls, can be found throughout this land. There are flowing springs to be tasted if one knows how and where to find them. Potholes and tinajas, natural water jugs, lie waiting to be scooped with a cupped palm. This is a dry land, no doubt, but it is not a barren one. There is not an abundance, but instead enough. The desert is a mentor in the ways of simplicity, reminding me of the importance of having only what I need. These canyons are continually revealing to me the truth that differentiates between essential and extra. My wife and I have found ourselves once again following the floor of a winding canyon, exploring and discovering a new sliver of this land we long to learn. Towering red sandstone walls engulf us on either side. The leaves of the cottonwoods are a golden yellow, fluttering with the sporadic brush of the wind. Perfectly symmetrical splitter cracks run from canyon floor to rim, interrupting the otherwise blank vertical walls. A passionate climber could spend a lifetime scaling the fissures found here. At sharp bends are huge, amphitheater-like alcoves that have been slowly carved and shaped by the floods of time. Sound reverberates off the rounded walls with a sharpness and clarity not to be outdone by even the finest of venues. More proof that man still has a lot to learn from the earth. We find ourselves at an unnamed, unmapped spring. Crystal clear water is gushing out onto the canyon floor, spreading and forming smaller, braided streams that weave in and out of each other as they glade over the dark, sculpted sand. Kneeling down, I cup my hands, bringing the clear, cold water to my sun dried lips. We notice animal tracks spread throughout the surrounding wet sand. Mule deer, raccoons, coyotes, a mountain lion; this place provides life for many. Looking around while listening to the gurgling water, we notice figures drawn high on a ledge. Staring more intently now, we began to make out human representations with arms and legs. In other clusters, we see mixtures of handprints and spirals. On the high bench above, remnants of a dwelling are now visible. Simple stone and mortar walls, these are all the handiwork of a people long passed. These were the first desert lovers. Ancestral Puebloeans, Anasazi, the Ancient Ones. Over time, I have been blessed enough to see much of what they left behind. Cliff dwellings ranging in size from one room to fifty, kivas with wooden ladders leading down into the earth, and intricately decorated pottery. I have found arrowheads and spear tips and the chipping beds where they were formed and have held 1000 year old sandals fashioned from yucca fibers. We scramble up the loose talus for a more intimate view, flooded with feelings of wonder, excitement, and reverence. I study the pictographs and petroglyphs while trying to imagine the stories they long tell. Pieces of pottery and corn cobs were strewn next to the fire pit where charred wood still remained, as if it had been sat around, casting shadows on the wall the night before. In the grass and mud mortar that held together stone walls, fingerprints were still evident from the day the mortar was pressed and shaped. Staring at a set of these timeless impressions, I notice a slight inconsistency in the wall. There is a small opening just big enough to fit a hand. Not able to make out what is in the shadows of this nook, I blindly reach in. Looking down at what I now find resting in the palm of my hand, I am nearly overcome with emotion. The carvings on the handle are intricate and the tip chipped and formed of chert, the two pieces being joined together with pine pitch. I held a totally intact, perfectly useable knife. Suddenly, the gap of time that separated me from them seemed to dissappate. I stood there, wondering who was the last person to grasp this tool? Looking back down the canyon and off into the wild landscape stretched out before me, I felt as though I was taking in the same view as they had so many years before. It was as if we stood there together, this family of hunters and cultivators, artists and dreamers, once perched high on this canyon wall. More than anyone, these people knew this place. Their understanding was intimate and their connection mystical. The spring below was a gift from the earth, the full moon part of the heavenly cycle, and vastness and beauty of the land characteristics of the Great Spirit. Were these any less true today? For this rugged, wild landscape I am grateful. There is no pavement here to disconnect me from the land upon which I tread and no sky scrappers to incumber the view across the vastness. In this desert country I am able to feel. The harshness and the solace I experience here are humbling. I am able to connect with what is and what was. I realize and remember the gifts of the Great Spirit and the sacred quality if his creation. Just as the sand seems to find its way into every nook and cranny, every crack and crevice, it has also made its way into my blood. It has found its way into my soul. This land has fascinated and captivated the hearts and minds of many before me, and now I find myself as they did, powerless to its draw . . . just another desert lover. This is another day in our first week of guide training. These 15 people from their random walks of life and various parts of the country have all come here for one common goal, to become a river guide. As we scout, or study a rapid from the riverbank, I point out differing current lines and features. The trainees take time to look and begin to implement their “water-reading” knowledge, asking questions and developing ideas for how to run the rapid. We talk about hazards and the different pros and cons to varying routes. Scouting gives the opportunity for questions and clarification, something that can be hard to find time for in the midst of a rapid a few hundred yards long, containing 8 to 10 foot waves and a must miss feature known as the Meat Grinder. As we head back upstream to our boats, I notice a few trainees stop to look back, trying to pick out the line or certain features from a slightly different vantage point. It’s interesting how what we see and the way we see things has a lot to do with where we are standing. The world can look completely different from a different point of view. There remains a lot for this training class to learn, with skills to be honed and a relationship with this wild and wonderful river to be fostered. But perhaps their greatest insight will be into a new point of view. A perspective that many people will never have. The view from the back of the raft, the perspective of a river guide. A light fog slides its way in and out of the river’s gorge, drifting through the trees and then down to the water’s surface. We push off from the rocky bank and drift as well, our path almost as unknown as that of the fog around us. There is over 100 years of collective whitewater rafting and river running experience in this raft, but as we move further downstream, the six of us are not relying on our familiarity with the rapids. Instead we are continually looking downstream, reading the water and paying close attention to what it is telling us. The river often seems to disappear into a garden of car and house sized boulders. It is a maze with different chutes and channels of water, some offering a runnable line over a steep drop and passage onto the next set of rapids. Others simply lead to a dead end, allowing your raft to find itself atop shallow rocks where the water is no more, and now considerations must be made as to how to get back to try a different channel. Aside from finding ourselves stuck in one of the previously mentioned channels, being out here on the New River “Dries” is quite the treat. The riverbed itself is gorgeous. Though the six of us have each paddled this section of whitewater many times before, no one had ever seen it at this low of a flow. As we move through boulders standing 10 and 15 feet overhead, we reminisce and trade stories about times we had paddled this section when those same rocks we completely submerged, creating huge waves and hydraulics. We joke about how we had never noticed the beauty of the cliffs, the waterfalls, and the natural arch like we were today, largely because at high flows we were white-knuckle paddling for our lives through a rapid aptly named Mile Long. Not only is it a treat to simply experience this rarely paddled section of whitewater, but today we are also getting to be a part of what could be the next step for the whitewater industry in the area. 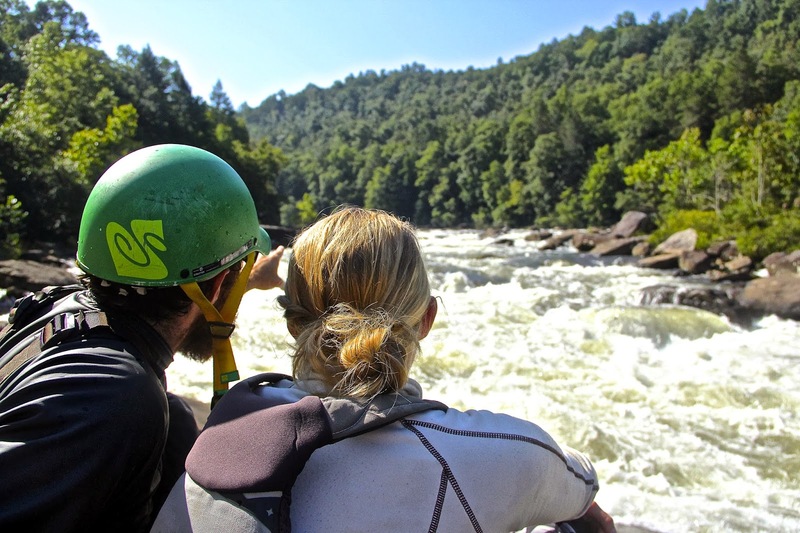 For many years now, this part of West Virginia has been famous for its commercial whitewater runs on the New and Gauley Rivers. 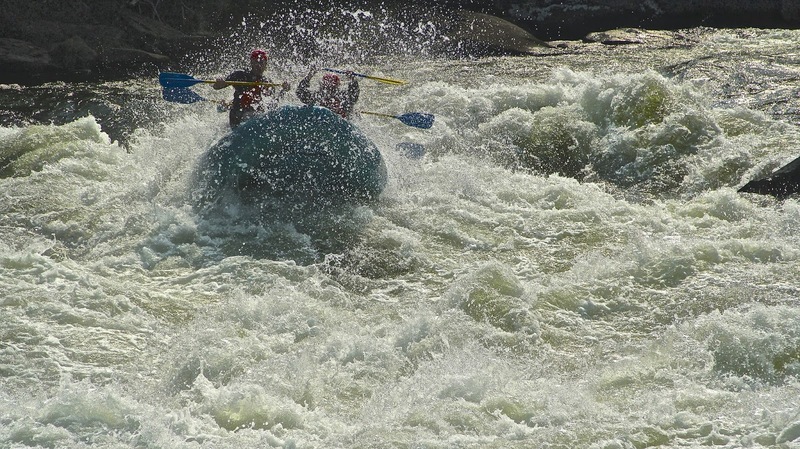 But now, with the Hawks Nest Dam approaching its relicensing date, there is an opportunity to establish a new stretch of whitewater for commercial rafting. Though still in its early stages, this trip down the “Dries” marks the beginning of a feasibility study which will help determine what flows are viable for whitewater rafting. The ultimate idea is that if we can determine what our necessary flows are for boating, and then during the relicensing process those flows can be factored into scheduled releases, similar to the scheduled releases we enjoy on the Gauley River. In the not too distant future, a whole new stretch of world class whitewater could be available to take people rafting down, giving us even more opportunities to share the beauty and the thrill of paddling these special places. I pull the strap through the buckle, tightening down the last bit of equipment into the raft. I check my gear once more . . . carabiners are locked . . . my PFD is snug. As I look out on the gentle current moving by, I can hear the trip leader finishing up their safety talk behind me. I take a long, deep, deliberate breath. Every spring, there is always that “first trip back, ” and with it usually comes some nervous energy, an anxious anticipation. But this year’s first trip carries with it a little more weight. I have been thinking about this one for a little bit longer than usual. Last year my river season came to an abrupt end in the form of a dislocated right shoulder at the bottom of a Class V rapid on the Upper Gauley. Thanks to friends and fellow paddlers, I was safely evacuated from the river. While on the river bank, guides used their Wilderness Medicine training and were able to reduce the dislocation. Although there were moments of extreme pain, what was actually more intense was the creeping thought that my shoulder might not ever be the same. The off season consisted of 7 months of rehabilitation and strength training, working to regain full range of motion and mobility. But even after all the rehab and the winter paddling and the fact the my shoulder was feeling really good, I knew that none of it would compare to that first trip back. It was not only a physical hurdle, but more so a mental one that I knew I would have to face. One of the most important lessons I have learned from my years of guiding and spending time out on these wild rivers is the importance and the value that exists in pushing myself both mentally and physically. There is so much that can be realized about oneself through the act of taking risks. For the last 11 years, I have had many opportunities to be a part of other people pushing themselves and taking risks as well. Guiding my guests down world class stretches of whitewater and seeing how empowering it is for people to engage with nature is the most rewarding part of my job. There is something that exists in the wildness of a river and in each of us that often does not get tapped into in everyday life. It is what I come back for year after year. It is why I find myself rigging this raft and standing at this put-in this morning. Hours later we have run the last rapid and are at the take out. The boats are loaded and high fives have been given all around. I can hear the boy scouts and troop leaders reliving their day as they get on the bus. I look out on the gentle current moving by and take a long, deep, deliberate breath. This has been a good first trip back.